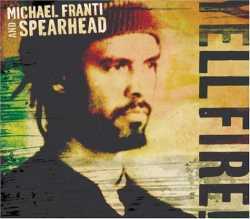 As a long-time admirer of Michael Franti, I was really looking forward to this disc. I first became familiar with his art-punk band the Beatnigs thanks to the patronage of Jello Biafra at the end of the `80s. In the middle of the next decade, I could recite whole passages from his group Disposable Heroes of Hypoprisy, but missed them when they played at my college, opting instead to see Shadow Project that night in Hollywood. (as Rozz Williams soon killed himself, I’m glad I went.) Since then I have seen him give talks, perform spoken word, and play both acoustically and with his band Spearhead. For an artist of such breadth, it’s only fitting to keep producing works that embrace and evolve into other genres; the problem is Me. I don’t like reggae. I just don’t. I try and try. The closest I can manage is really dubby stuff like Sly & Robbie (who thankfully are both on this album! ), but otherwise, what is a poor music reviewer to do? I can only take so much “One Love” on One Record. But all is not lost. First of all, yes, I do feel like a total Scrooge saying all that. And if anyone can still sense the good in me and bring me back from the dark side, it’s Franti. So, armed with a new attitude and willingness to give the record a few more listens, I begin. To me, Franti is first and foremost a poet. A consummate lyricist, rapper and speaker, both his voice and words just seem so naturally rich and beautiful. The verses of the opening track “Time To Go Home” have a delicate, melancholy melody that I might mistake for Ben Harper—other pieces are in this vein such as “Sweet Little Lies” and most of the end of the record. Yet by the bridge of the first tune, that familiar keen wit is in full-force, grittier, but not lost in anger. “Time To Go Home” also shows off some great orchestration. Minimal and open at first, it draws you in with lovely guitar lines and keys and establishes the inherent partnership of Franti & Spearhead. “East To the West” and “Hello Bonjour” are both joyous. Even though they aren’t in my favorite musical style, I still enjoy the clever and pertinent lyrics/vocals. Franti deftly combines social commentary, history lessons, and somehow humanity and a bit of fun. “One Step Closer To You” seems like a very personal journey. In a way it’s a love ballad, but it’s also about personal discovery. Pink lends some soulful backing vocals here, proving my longtime theory that track 7 is good on every record. A couple of my other favorites are “What I’ve Seen,” with its haunting, tinkling guitars and somber poetry, and the intimate acoustic closer “Is Love Enough.” Mostly solo guitar and voice, it paints a striking and almost desolate picture, but the chorus urges us that change comes from each of us—if we can love enough, we can transcend the boundaries of class, geography, language and culture. Overall the record won me over—though it was mostly the sad songs, I can honestly say that the reggae-infused numbers had me crack a smile or two. I might have even thrown my hands in the air.